Phoenix, Calgary, Los Angeles, San Diego, Tucson, Phoenix, San Diego and back to Calgary… And all of it in less than a month, with the opportunity to honor the mystique of the lunar eclipse, and some heartfelt time on the phone or in person with those I care most about at Christmas and New Year’s scheduled in for good measure. As a woman who barely went anywhere out of Calgary for 21 years, I have to admit that as much as I am fueled by our progress as a team of thought-leaders and key strategic alliances, living out of a suitcase and bunking in yet another hotel, friend or colleague’s home for 2-5 days at a time, and up to almost three weeks consecutively, is already stretching my resolve. The travelling of the last year and a half hasn’t all been working toward the dream. Even though it seems like a lifetime ago already, I have gifted myself two trips by which to nurture myself. The first, a vacation to do some writing in Italy in September and then the second, shortly thereafter to see the ruins of Chichen Itza for the first time in November. But if the truth be told, the real adventures of the last year and a half have been inside me. Through the very act of making a conscious choice to take down and dust off from that shelf the years of journaling and note taking, and even to dust off myself, to revisit the dream “one more time”. 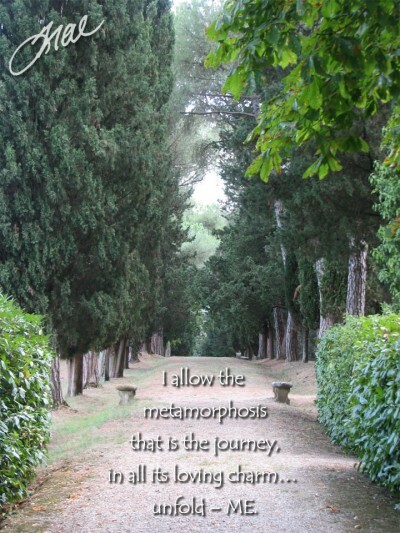 And from there, to allow the metamorphosis that is the journey, in all its loving charm… unfold – me. For 2010, I set clear intention. I chose to see, hear, recognize and participate in whatever signals there were abiding for me, and I gave myself permission to receive those signals no matter what they were. Most of all to know within the core of my being, that I have the courage to allow and act upon every opportunity (or not) from a place of centeredness in my highest good, with all of it. Since then, those possibilities and new experiences have emerged daily – free of expectation for anything but savoring the moment and giving gratitude. And I continue to bask in the light of that gratitude still. Most of you who have been following me on Facebook say that my postings are incredibly “cryptic”. Some of you have quite candidly expressed that you wish I would be far more literal and far less abstract, so that you could truly share in the path with me. And even for a select few of you, you full-out intervened, and honestly shared with me how much you felt like I was hiding. I’m willing to admit, that as much as I had convinced myself that the way I was expressing myself was in the name of protecting the innocent, being “respectful” and “appropriate” around what I share… that truly, those people who intervened are accurate in their observations. I had in fact been hiding. Out of fear. Because before, every occasion I tried to pursue the dream, it was just me moving through it – or me and the two primary partners I had with me (both personally and professionally) at the time, at my side. So if it just got too difficult, running into brick wall after brick wall, or if it appeared that it was just too big and altruistic for anyone to grasp that people could really “be” in cooperation to the level that I believed… well then, I could just let it go in silence, and if not in silence, at least with some degree of anonymity. But now I, and my partners have followers, and 9 other team members, and more beautiful minds and hearts on the horizon coming along on the journey. Other professionals whom I respect, and whom have allowed themselves also, to step into the mystery of the process and embrace the dream for their own reasons. • When communications internally and externally, just got “messy”. So here I am again… Stepping out with my heart to openly and willingly be in that vulnerable place and share all of me that much more – and to grow. To share the steps and the learnings; the beefs and bouquets; the bright and shiny celebrations and the blunders; because I’m beginning to see how transparency takes the learning and the path itself that much deeper for those who choose to take the journey for themselves. I don’t know how it’s all going to turn out. But if this last year has been any indication, the places and spaces in which I have found myself, and in which I am truly finding myself… in mind, in heart, in body, and soul, have only just begun. I pause, and snuggle in deeper… the oversized fleece blanket and pillows which surround me, warmly cradling my body as my fingers play with the words which grace me with their “presence”… revealing themselves through the “click, click, click” of my keyboard. “Yes… “, I reassure myself. “It IS worth it.” This IS my life. Everything, in all its beauty and all its messiness, IS happening here, now. And I am truly grateful… for the “magic”.